Our modern immaculate vessels provide the epitome of comfort and style for our charter fishing clients. Outfitted with the latest in tournament-level gear, including custom rods and top-notch reels and tackle, these vessels will provide the casual fisherman, as well as the expert angler, with the best tools to accomplish their goals of reeling in trophy gamefish. Our knowledgeable captains will not only guide you to the premiere fishing spots, but are more than willing to lend their expertise to teaching technique to novice anglers. Our patient crews are more than pleased to offer tips and local tricks that even the saltiest veteran fisherman will appreciate. 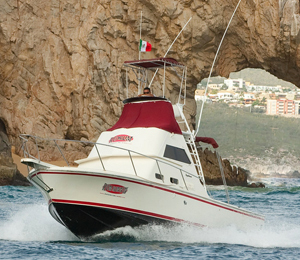 We are dedicated to providing a safe, comfortable, enjoyable and successful off-shore fishing charter that will provide the highlight of your vacation to the tropical paradise of Cabo San Lucas. The 28-foot Californian fishing boat, the ReelRum, is the perfect vessel for a full day of fun in the sun with our Cabo Fishing Fleet. This boat can take up to 4 guests on a journey out to sea to catch all your favorite catches! Fishing in Cabo is great year-round so make your reservations now! Two fighting chairs, on board bathroom and single engine inboard Cummins. Great for smaller groups of 4 or less, the 28-foot Californian TantRum is one of the best deals out there for Cabo fishing! 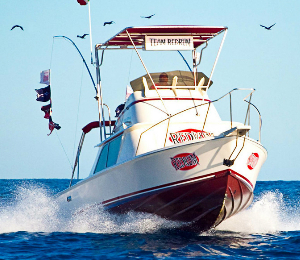 Cabo Fishing Fleet's 32-foot Crystalliner, the RumRunnin, is Cabo fishing in style! 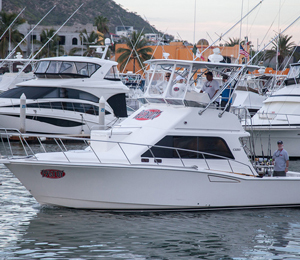 This spacious 32-foot fishing vessel will take you out to the deep blue waters of Los Cabos to go on the fishing adventure of a lifetime for up to 6 guests. 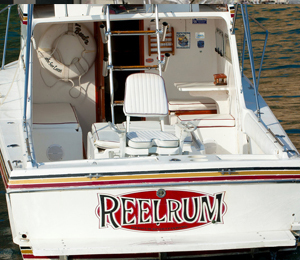 You and up to 4 of your friends can join us for a fishing trip like no other on the 31-foot Bertram known as the RedRum. 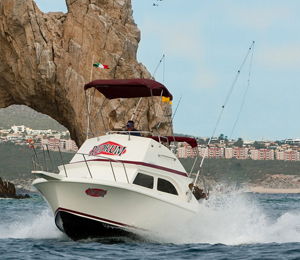 Go fishing with one of the most experienced fishing teams anywhere in the Los Cabos area. Space and luxury is the name of the game when it comes to the El Nuevo, a 33-foot Bertram fishing vessel that can be the setting for a truly unforgettable Cabo fishing charter. This boat can hold up to 6 guests. 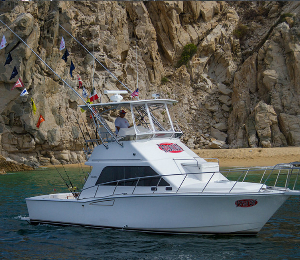 One of our larger boats for Cabo San Lucas fishing, the 19s toy is a spacious 35 foot Cabo fishing vessel, complete with an indoor cabin with air-conditioning. This charter can take up to 8 lucky guests out to sea for a fishing trip like no other!